The important features of the CSB such as efficiency, high quality components, simple handling, easy access, cost effective maintenance and low noise level will undoubtedly improve the quality and performance of your workspace. The fixed speed version is really efficient thanks to the ES 3000 controller and its intelligent shut-down function. IVR version will allow you to save up to 30 % of compressor energy cost working at a constant pressure. Today CSB is available from 15 up to 30 hp installed on tank always with refrigerant dryer to save installation cost and space. 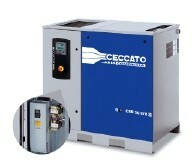 A complete and adaptable solution for your compressed air demand! Filters option for air quality improvement. 53 & 55, Jalan Hon 34/10, Bukit Kemuning Industrial Park, Seksyen 34, 40000 Shah Alam, Selangor, Malaysia.